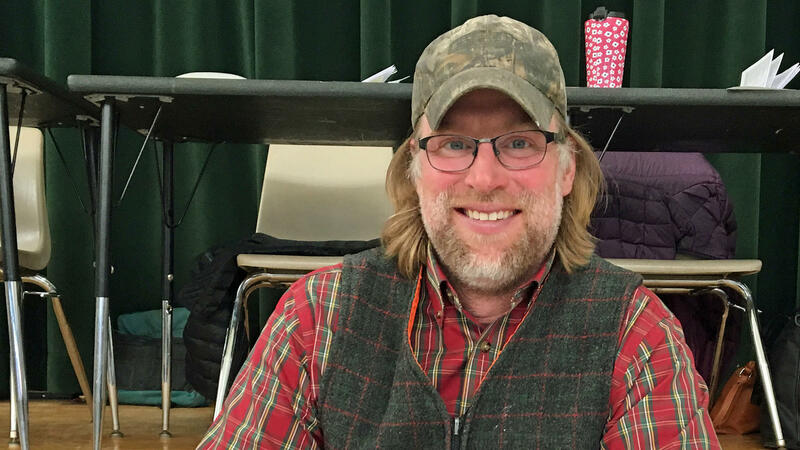 Zeb Towne, the elected dogcatcher of Duxbury, Vt. "I'm the only person in the country who gets elected as a dogcatcher. So, I'm awesome, I guess," says Towne. The story really hit home for me, because I cover politics, and I love dogs, so I've put a lot of thought into how you would run a campaign to be elected dogcatcher. In fact, I've always thought that of all the elected positions out there, dogcatcher was the one I was best-suited to run for. My campaign platform would center around my proven track record of catching multiple neighborhood dogs. Campaign brochures would feature Otis, a stray who showed up in my neighborhood a few years ago in Sacramento. He was a small, dirty schnauzer-esque mutt who took up residence in a nearby bush. Otis looked friendly and happy, but he'd dash away the moment you got near him. And, I should clarify, Otis is the name I decided on when I made it a personal pet project to round Otis up and bring him to the shelter. This led to several days' worth of Coyote-and-Roadrunner situations, including one that had me sprinting down the back alley with a leash, a jar of peanut butter and a schnauzer just a few yards ahead of me. I had a lot of time to focus on this task, since my wife had moved across the country to Washington, and I was still looking for a job out there. After day two or three, she gently suggested that perhaps the Otis mission had just a little bit to do with the stress of a job search, and I conceded she may have been onto something. A neighbor and I finally rounded Otis up, and I confirmed — after repeated calls to the shelter — that he found a happy ending somewhere in the Pacific Northwest. But I hate to tell you, America's only elected dogcatcher did not get that same happy ending. Turns out, it is against Vermont law for a town to elect its own dogcatcher. After our story aired, someone from Duxbury got in touch with the Vermont League of Cities and Towns. A lawyer there pointed out the bad news: dogcatcher is not an official elected position in the state. For now, dogcatchers can only be appointed. Towne still has a job though. Someone moved to appoint him dogcatcher, and the vote was unanimous. He even got an assistant. I guess Duxbury has a lot of dogs on the loose. But if the town ever does change its rules and get the OK from the state to bring back elections, I may just have to run a carpetbagger campaign and challenge Towne. A couple of weeks ago, WEEKEND EDITION told you about America's only elected dogcatcher, Zeb Towne. He has held that position in the town of Duxbury, Vt., for 15 years in a row. Towne told us he had never been bothered by that time-worn political insult you couldn't get elected dogcatcher. The story really hit home for me because I cover politics, and I love dogs, so I've put a lot of thought into how you would run a campaign to be elected dogcatcher. In fact, I've always thought that of all the elected positions out there, dogcatcher was the one I was best suited to run for. My campaign platform would center around my proven track record of catching multiple neighborhood dogs. Campaign brochures would feature Otis, a stray who showed up in my neighborhood a few years ago in Sacramento. He was a small, dirty schnauzer-esque mutt who took up residence in a nearby bush. Otis looked friendly and happy, but he'd dash away the moment you got near him. And I should clarify - Otis is the name I decided on when I made it a personal pet project to round Otis up and bring him to the shelter. This led to several days' worth of Coyote and Road Runner situations, including one that had me sprinting down the back alley with a leash, a jar of peanut butter and a schnauzer just a few yards ahead of me. I had a lot of time to focus on this task since my wife had moved across the country to Washington, and I was still looking for a job out there. After day two or three, she gently suggested that perhaps the Otis mission had just a little bit to do with the stress of a job search, and I conceded she may have been onto something. A neighbor and I finally rounded Otis up, and I confirmed after repeated calls to the shelter that he found a happy home with a family somewhere in the Pacific Northwest. But I hate to tell you, America's only elected dogcatcher did not get that same happy ending. It turns out it is against Vermont law for a town to elect its own dogcatcher without state approval. After our story aired, someone from Duxbury got in touch with the Vermont League of Cities and Towns. A lawyer there pointed out the bad news. Dogcatcher is not an official elected position in the state. For now, dogcatchers can only be appointed. Towne still has a job, though. Someone moved to appoint him dogcatcher, and the vote was unanimous. He even got an assistant. I guess Duxbury has a lot of dogs on the loose. But if the town ever does change its rules and get the OK from the state to bring back elections, I may just have to run a carpetbagger campaign and challenge Towne. Transcript provided by NPR, Copyright NPR.